Hawk has been teaching enterprise development in many industries and locations. He relies on a wide array of formats, including site visits with his students. He also lectures, writes and sets up demonstration projects. He has relations with many executives who have participated in his research and teaching in many countries including Brazil, China, England, Finland, Germany, Japan, Sweden and the United States. Hawk was a teaching assistant at the University of Pennsylvania, a research assistant at the Wharton School, an instructor then a visiting professor at the Stockholm School of Economics, a professor in the Engineering School, Iowa State University , and then a professor in Architecture and Management at New Jersey Institute of Technology. He works in development of business internationalization. In his “Conditions of Success” project he worked with CEOs of 60 international firms to discover the fundamental importance of growing environmental concerns to redefining business. He is known for his development of alternative regulation theories that shift from what is written to what is done, principles of fluid management, growing liquid enterprises, negotiated order to replace legal order, Socratic interaction replacing Aristotelian reaction, Lao Tze ideas of change seen in: “The greater the number of laws and enactments, the more thieves and robbers there will be.” replacing the emphasis on Confucian changelessness seen in his emphasis on discipline where: “Success depends upon previous preparation, and without such preparation there is sure to be failure.” Hawk is currently dealing with how the eternal feminine (Goethe) replaces the barbaric masculine (Schwarzenegger) . He helped develop a new kind of masters degree in financial engineering and ethics, via greater transparency of Wall Street modelling, which was to limit corruption. Hawk helped develop and initiate a leading international business think tank, The Institute of International Business, Stockholm School of Economics. He designed and managed the Institutes’s first research project, “Environmental Deterioration: Analytic Solutions in Search of Synthetic Problems.” Conduced in 1975-77 came to be funded by Swedens Parliament and was presented to OECD as an alternatives to the US legalistic model. It was later used by the US to initiate the non-regulatory Energy Star model. Hawk’s 1989-91 study into rethinking internationalize in light of environmental challenges, “Conditions of Success,” involved leading international companies from many countries. In 2007 it was used by World Economic Forum researchers to launch a follow up study. Hawk served as a member of a National Academy of Sciences Commission to study how new practices of business could be used to improve government operations. Hawk briefly served an an NJIT dean to improve the intent and content of the curriculum students. 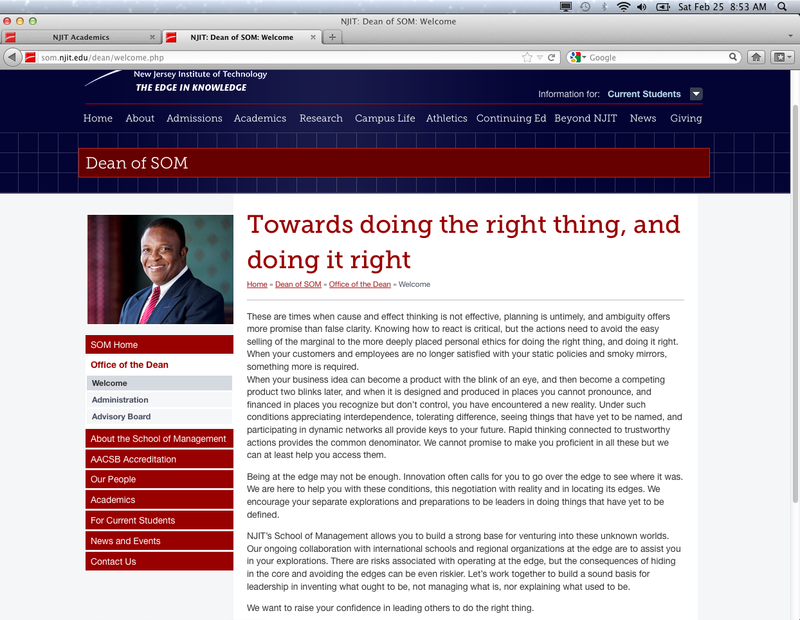 As a preamble on this objective Hawk offered a “Dean’s Welcome Statement” for the NJIT website. It was to tell students what they can expect from the School, to prepare them for the 21st Century version of business. The preamble was mostly in opposition to the School’s normal teaching. It was supported by industry leaders advising Hawk who were searching for new kinds of employees. The School Advisory Board was not used in this process in that none were industry leaders nor cared much about business leadership. The statement, as it continues to be used by four subsequent deans of the School as their personal statement (i.e., plagiarism? ), is seen below. 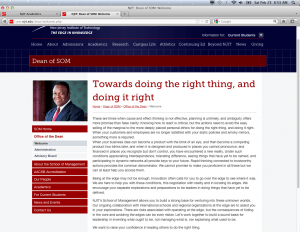 It can also be seen on NJIT’s website. Hawk does not know this person in the photo. He has been a consultant and adviser for many firms in many industries. His major areas of work have been: creating liquid enterprises, implementing principles of fluid management, new business initiation and development, business-government relations, and moving beyond the limits of strategic thinking. He currently serves as a senior adviser to China’s largest company which recently issued an IPO and has become especially successful in international operations. He works closely with the Public Policy and Management School at China’s leading university and lectures in leading Chinese firms interesting in experimenting with alternative economic models and business practices. He runs an experimental farm in Iowa, which has a corporate retreat used for meetings by various organizations. It is the “Center for Corporate Rehabilitation,” located near the center of his farm. It was designed and constructed in a highly unusual manner, and is currently being used in a business case study for use at other universities. He is a veteran of the Vietnam conflict. Below is a more readable version of the Hawk written statement used by so many in NJIT Administration over so many years to attract students to NJIT. It is somewhat informative of Hawk’s values and thinking. While it is said to capture student enthusiasm, it is reportedly of no relation to the values students now encounter at NJIT. There is hope for the statement aspirations but maybe not there. “These are times when cause and effect thinking is not effective, planning is untimely, and ambiguity offers more promise than false clarity. Knowing how to react is critical, but the actions need to avoid the easy selling of the marginal to the more deeply placed personal ethics for doing the right thing, and doing it right. When your customers and employees are no longer satisfied with your static policies and smoky mirrors, something more is required. When your business idea can become a product with the blink of an eye, and then become a competing product two blinks later, and when it is designed and produced in places you cannot pronounce, and financed in places you recognize but don’t control, you have encountered a new reality. Under such conditions appreciating interdependence, tolerating difference, seeing things that have yet to be named, and participating in dynamic networks all provide keys to your future. Rapid thinking connected to trustworthy actions provides the common denominator. We cannot promise to make you proficient in all these but we can at least help you access them. Being at the edge may not be enough. Innovation often calls for you to go over the edge to see where it was. We are here to help you with these conditions, this negotiation with reality and in locating its edges. We encourage your separate explorations and preparations to be leaders in doing things that have yet to be defined. NJIT’s School of Management allows you to build a strong base for venturing into these unknown worlds. Our ongoing collaboration with international schools and regional organizations at the edge are to assist you in your explorations. There are risks associated with operating at the edge, but the consequences of hiding in the core and avoiding the edges can be even riskier. Let’s work together to build a sound basis for leadership in inventing what ought to be, not managing what is, nor explaining what used to be.